180 total patches, 36 cents each. 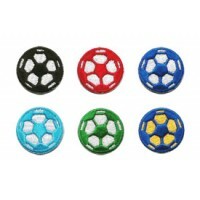 30 each of Black, Red, Blue, Light blue, Green & Blue/Yellow iron-on soccer ball patches. Retail value $90. You can Substitute Colors by entering what you want in the Comments Box on Step 5 when you Order (on the Payment Method page). Multiples of ten only please.